In 1991, River Phoenix and Keanu Reeves, portraying two street prostitutes in ‘My Own Private Idaho’, took us on a trip to the dark side of the USA – a seedy, disturbing and vulnerable place entirely at odds with the great American Dream. It also launched one of Hollywood’s most unusual and distinct cinematic careers with Gus van Sant. Since then, oscillating between classic Hollywood productions like ‘Good Will Hunting’ or ‘Milk’, and highly experimental, challenging art house movies such as ‘Drugstore Cowboy’, ‘Elephant’ or ‘Last Days’, Gus van Sant is one of the very few directors to work within and without Hollywood with remarkable ease and credibility, shaping a strangely addictive and consistently courageous filmography. 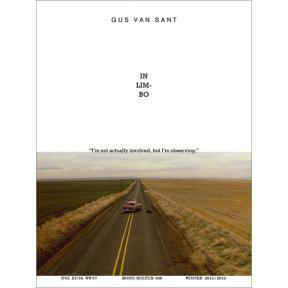 If anything, it is a recurring affinity for the fragile and excluded – addicts, hustlers, politicians, rock stars – and for youth, at that breaking point where innocence ends, that unites van Sant’s vast and diverse body of work. Gus van Sant offers us a profoundly humane view of the world. It is a cinema defined by tenderness and slowness, preferring to observe rather than manipulate. A cinema of gaps and open endings, where mood reigns over meaning, where what we see and hear doesn’t quite add up, leaving us wondering. In a suitably meandering interview with mono.kultur, Gus van Sant talked about his second chance as a director, inventing films on the spot and why Hollywood always wins. Visually, the issue is heavily influenced by Gus van Sant’s quiet cinematic style, submitting itself to an endless horizon of American landscapes, leaving ample space to words, skies, and the occasional figure drifting into sight.